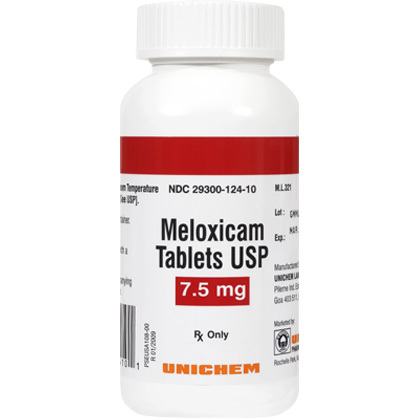 Meloxicam is a nonsteroidal anti-inflammatory (NSAID) prescription medication used to reduce pain, inflammation, and stiffness as a result of acute and chronic musculoskeletal disorders such as osteoarthritis. Meloxicam works by reducing hormones that cause pain and inflammation in the body. Meloxicam may also be used for purposes other than those listed here. Meloxicam is sold per tablet and requires a prescription from your veterinarian. Meloxicam works by reducing hormones that cause pain and inflammation in the body. Tell your veterinarian if your dog has: an allergy to aspirin or any other NSAID; an ulcer or bleeding in the stomach; liver, or kidney disease; congestive heart failure; fluid retention; bleeding disorders; heart disease or high blood pressure. Tell your veterinarian if your dog is pregnant or lactating. What is the most important thing I should know about Meloxicam? Meloxicam is a prescription medication that is not FDA approved for veterinary use. However, it is a commonly accepted practice for veterinarians to use Meloxicam in dogs. 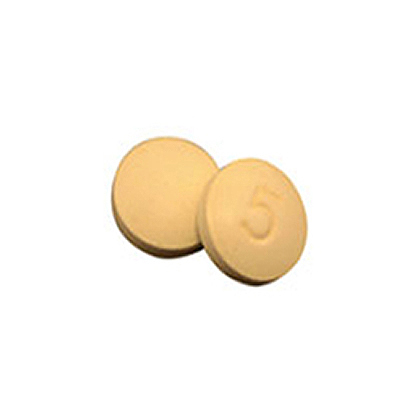 Meloxicam is available as 7.5 mg tablets. The usual dose in dogs is 0.1 mg/lb as an initial dose the first day, followed by 0.05 mg/lb once a day thereafter. Contact your veterinarian if the pet has bloody, black or tarry stools, blood in vomit, swelling or rapid weight gain due to fluid retention, unusual fatigue or weakness, yellowing of the eyes, excessive itching, abdominal pain or tenderness as these symptoms could indicate serious side effects. What should I discuss with my veterinarian before giving Meloxicam to my pet? Tell your veterinarian if your pet has an allergy to aspirin or any other NSAID, an ulcer or bleeding in the stomach, liver or kidney disease, congestive heart failure, fluid retention, bleeding disorders, heart disease or high blood pressure. Tell your veterinarian if your pet is pregnant or lactating. How should Meloxicam be given? Give this medication exactly as directed by your veterinarian. If you do not understand the directions ask the pharmacist or veterinarian to explain them to you. Meloxicam may be given with or without food. Keep plenty of water available for your pet. Store Meloxicam at room temperature, away from moisture and heat. Keep this medication away from children and pets. What are the potential side effects of Meloxicam? Contact your veterinarian if your pet has bloody, black or tarry stools, blood in vomit, swelling or rapid weight gain due to fluid retention, unusual fatigue or weakness, yellowing of the eyes, excessive itching, abdominal pain or tenderness as these symptoms could indicate serious side effects. If any of the following serious side effects occur, stop giving Meloxicam and seek emergency veterinary medical attention: an allergic reaction (difficulty breathing; swelling of the lips; tongue or face; hives); muscle cramps; open sores in the mouth; seizures; abdominal cramping. Other less serious side effects may occur. Continue giving Meloxicam and talk to your veterinarian if your pet experiences headache, dizziness, nausea, diarrhea, or constipation, depression, fatigue or weakness, dry mouth. Other side effects may also occur. Talk to your veterinarian about any side effect that seems unusual or bothersome to your pet. What happens if I miss giving a dose of Meloxicam? Give the missed dose as soon as you remember. However, if is almost time for the next regularly scheduled dose, skip the missed dose and give the next one as directed. Do not give a double dose of the medication. What happens if I overdose my pet on Meloxicam? Seek emergency veterinary medical treatment. Symptoms of Meloxicam overdose include nausea, vomiting, stomach pain, loss of consciousness, drowsiness, headache, cardiac arrest, stomach pain, seizures, little or no urine production, and slow breathing. What should I avoid while giving Meloxicam to my pet? Many over the counter cough, cold, allergy and pain medicines contain aspirin or other NSAIDs similar to Meloxicam. Before giving your pet any prescription or over the counter medications talk to your veterinarian or pharmacist. Tell your veterinarian if your pet is being given aspirin; another NSAID such as etodolac, carprofen or piroxicam; an over the counter cough, cold, allergy or pain medication; furosemide; or warfarin. Talk to your veterinarian before giving your pet any prescription or over the counter medicines. See below chart for suggested dosage. Contact your veterinarian if your dog has bloody, black or tarry stools, blood in vomit, or swelling or rapid weight gain due to fluid retention. The usual dose is 0.1 mg/lb for the first day followed by 0.05 mg/lb once a day thereafter. Keep plenty of water available for pet to drink. Should be stored at room temperature. Protect from light, moisture, and heat.